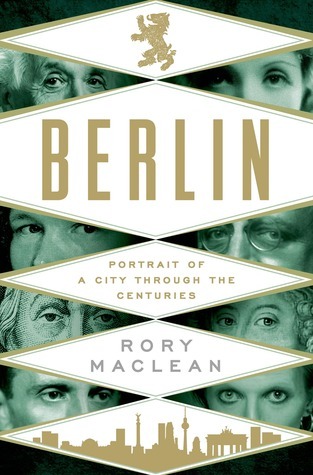 Rory MacLean gave his book on Berlin the subtitle “Imagine a City.” His American publishers changed this to “Portrait of a City Through the Centuries,” which is odd because it loses the ties to MacLean’s prologue “Imagine” and epilogue “Imagine Berlin.” Further, the book is not a portrait but rather a collection of almost two dozen portraits of particular people (most of them real) who stand as exemplars of particular periods in Berlin’s history. Moscow would like a word. As perhaps would Rome and Tokyo, and in terms of being twisted and torn across five centuries of European struggles, certainly many cities in the continent’s central and eastern regions could give Berlin a run for the title. At any rate, MacLean has not written a comparative treatise, and the book is much better when it is particular than when it is general. My own first crossing, about 15 years later, was much the same, though it was at the S-Bahn station at Friedrichstraße rather than at Charlie. There was an underground labyrinth that ended in grey booths like cattle chutes. People were turned back because they were Asian, or for no reason at all. My questioner turned out, against type, to have a sense of humor (indeed more of one than I have seen US and UK border guards to possess). And then up into East Berlin’s streets to try to spend the mandatory currency exchange and discover what the other side looked like. I discovered bad beer, quite the achievement in Germany. He chooses 23 people to highlight, most real, a few fictional composites of people who very well might have lived the lives he sketches. MacLean weaves a few of the lives together; in other cases, history brought the people together or very nearly so. MacLean’s interest is in modern Berlin, so only three of his portraits show people from before the 19th century: one from the city’s earliest days, one from the Thirty Years War, and Frederick the Great. From there, the city grows rapidly and MacLean’s lives overlap as the 19th century gives way to Berlin’s fateful 20th century. The chapter on Walther Rathenau carries the date 1885, but although he was a great industrialist, he is best known for his political role during the Weimar Republic. Indeed, MacLean’s portrait describes his role as a minister, and closes with a detailed depiction of the day of his assassination in 1922. MacLean also devotes three chapters to developments entirely after the fall of the Wall. They are all vivid, and feel new, even in cases where I already knew the salient points. Käthe Kollwitz is here, her portraits of grief following immediately after the story of Fritz Haber, whose discovery of how to fix atmospheric nitrogen and make fertilizer has helped feed billions, and whose devotion to Kaiser and fatherland led him to develop poison gas as a weapon in the Great War. I find Haber more tragic than MacLean does. For first chapter on the years after 1989, MacLean tells the story of a Vietnamese immigrant who had moved from South to North as a child in another formerly divided country, came to East Germany on a socialist work exchange, endured chicanery under the Party and exclusion after Communism’s collapse. He shows how some people with this background integrated while others never got past the smuggling and other shadow lives that had marked the immediate years after the changes. In his afterward, he says “The truth of the story — although not its facts was checked,” thus highlighting the uncertain nature of a life lived on society’s edges. The second is about party kids in Berlin’s club scene, a one-night stand with details filled in from plausible backstories, music, and Berlin film, not least Wings of Desire. I would have enjoyed a few more chapters on post-89 Berlin. As of last week, the time that has passed since the fall of the Wall is longer than the time that it divided the city. It would have been neat to have a U2 chapter about Achtung Baby as a counterpoint to the Bowie chapter. The spirit that came to Berlin with the wrapped Reichstag in 1995, the Love Parades that brought millions to dance in the city, or the changes wrought by the soccer World Cup in 2006 would all have been fine settings for a representative portrait. It’s a good sign for MacLean’s book that my main complaint is that I would have liked more of it. His book is not a conventional history of Berlin, but it is a splendid one.